Fake news has come to the fore in recent days as investigations into its influence on the 2016 US election and its sheer quantity have come to light. At the end of this election it was reported that the top-ranking fake news stories on BuzzFeed and Facebook actually got more views than the top-ranking real news stories. This is a serious problem that is way out of hand. But it begs the question as to why it is so successful. So we decided to investigate: what insights for inbound marketing and web content can we learn from fake news? And can we use these insights without being misinformative ourselves? Why Is Fake News Such A Problem? Fake news stories are often entirely fabricated and very political. And most importantly, they do everything they can to appear to be true. The best fake news stories are intriguing enough to get shared, linked to and viewed thousands of times, creating large degrees of influence around the world. One very well-known and politically influential news story in the lead-up to the US election was fake. The story is: terrorists funded 20% of Hillary Clinton’s campaign. In a large part, this contributed to the sentiment that Hillary Clinton was a ‘terrorist’, that she was ‘Hitlery Clinton’ and etc. In fact, this news story circulating through clickbait, memes, forums, word-of-mouth, social media and other unreliable, unreferenced sources is in fact fake. Someone, somewhere (with an anti-Clinton agenda or just an interest in creating high-ranking content) made this up. Why Is Fake News So Successful? To start to be able to learn from fake news, to use in your own online content (of the non-malicious kind we implore you), you need to understand what makes the most high-ranking fake news so popular. It actually is, divorced from its ethical failings, an example of well-executed social psychology. Google, in one metric of its algorithm, ranks the sites on a topic in the order in which they were published. Other sources quote you. The original article becomes a source for other, secondary source articles (even ones that intend to be truthful) (see: Newsjacking. This creates backlinks to your article (SEO). It gives an impression of being credible, honest and truthful. An this is especially impressive considering that it is the opposite. Website: one known for credibility or, as a second but more feasible option, one that isn’t known but ‘looks’ credible. Plausibility: content that touches enough bases with reality to be potentially the truth. 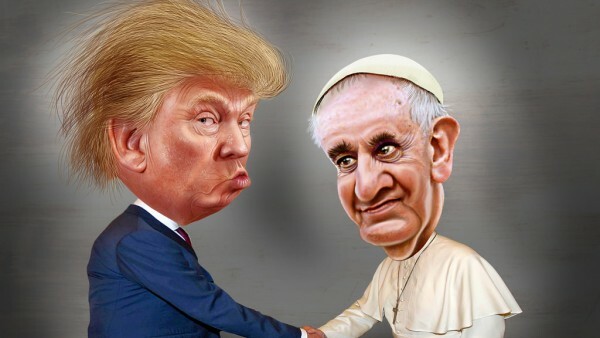 For instance, the story that Pope Francis endorsed Donald Trump for president seems plausible on the basis that the Pope is also right-wing. There are things on which he likely would support Trump. But the key to this point is finding the sweet-spot between plausibility and surprise. There are things on which the Pope would definitely oppose Trump, which is why this title is also intriguing . . . Fake news has the major advantage over real news of not being limited by the truth. It can be anything and everything the writer want it to be—it can be a perfect story. The best fake news writers are highly talented at pushing all the right buttons with their stories. For instance, the story that Pope Francis endorsed Donald Trump for president appealed to many people’s negative image of Trump. It would have hence appealed ironic and ‘juicy’ to people of this position. And it would also appeal to Trump supporters and other people who view Trump in more or a neutral or positive light, but still as a political maverick—a progressive within the right wing that is contrasted starkly with the conservatism of The Church. The title of the article hence contained a contradiction—a surprise, which prompted many people to find out why by reading the article. This is why many of the best fake news stories are political. In politics, there are just so many buttons to be pressed. And also, politics allows you to appeal to a very wide audience—many people from different walks of life are all affected by politics and are hence influenced by it. Furthermore, it isn’t difficult to appeal to both sides of a political debate, especially if it is polarised. For instance, there are many zealous Trump supporters and opposers in the US at the present time. What Can Inbound Marketing Learn From This While Maintaining Factuality? Originality. Create your own content or your own spin on content. For the love of Google don’t plagiarise. Aim to rank for long-tail keywords at which you have a far higher chance at ranking highly for than too-competitive keywords like ‘Trump’ for which you honestly don’t have a chance at first-paging. Intriguing. Appeal to things that resonate deeply with your audience and create a sense of surprise. This can be on any topic and it can certainly be truthful if you research it thoroughly enough to come up with something good. It became increasingly apparent while writing this article that it could be used as a guide on how to write fake news (!). It’s not. It’s a guide on how to write legitimate content only. And it’s my hope that if people are aware of the tactics that facilitate fake news, then they will have less chance of being mislead themselves, and this will decrease the prevalence of fake news. Now that that’s been established, best of luck using the dark teachings for fake news in your legitimate content. After applying these concept and practising getting them right, the successfulness of your content should improve considerably.